Down the serenely winding roads of an almost European looking corner of Chattanooga, Tennessee is a well-known sculpture garden in the Arts District. 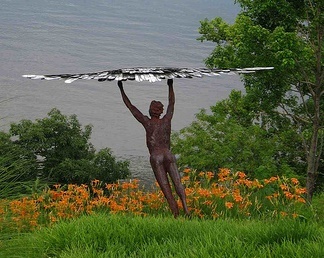 There stands a striking sculpture of Icharus that looks as though he could sail off the side of the cliff into the muddy Tennessee River below. Some know that Icharus, whose hubris was his downfall, flew too close to the sun with wax wings and fell into the sea where he drowned. What many don’t know is that directly under where Icharus stands frozen in time, is where a living legend first appeared to the Cherokee people across riverbank. Uktena is the name belonging to the horned serpent, a ‘monster’ which was once human but turned into an Uktena in an attempt to kill the sun. He failed, like Icharus, but still lives among the people. The great horned serpent is said to have a diamond on his head, with scales that appear to be ablaze. The crystal clear diamond has a red streak through the center and can be likened to the Holy Grail quest of Christian traditions. Only one warrior has ever captured the U’lun sunti (the diamond), but many have tried. With the diamond, the rightful owner can peer into the future and bring great luck to the people. But- do not, dear friends, go in search of the Uktena for yourself for as the story goes, it will bring instant death to White Man, and death to the family of the Cherokee person who sees it.